Salinity refers to the concentration of salts in water or soil. While salt is a natural feature of the Murray-Darling Basin’s landscapes and rivers — derived from ancient ocean sediments, the weathering of rocks and deposition by rainfall over millions of years — high salinity can reduce crop yields, affect aquatic ecosystems and vegetation and damage infrastructure. Water flowing through the river system and out to the sea through the Murray Mouth is the only natural way that salt can leave the Basin. However, river salinity can also be managed through salt interception. Salt interception schemes are an engineering tool used to divert groundwater and drainage water away from the river system. There are currently 18 salt interception schemes in operation, which divert approximately half a million tonnes of salt away from the river and adjacent landscapes each year. These schemes are implemented in conjunction with the Basin Salinity Management 2030 strategy. Another method of addressing salinity in the landscape is through improved farming systems. The clearing of native vegetation and the introduction of European farming practices has affected the natural water cycle in the Basin causing salinity problems. However, improved farming practices reduce the amount of water entering groundwater systems and the mobilisaiton of salt. salinity zoning — establishment of new irrigation development in areas where the impacts are low. use of deep-rooted plants (lucerne, saltbush, farm forestry) to minimise the rise of water tables. On behalf of Basin governments, the Murray–Darling Basin Authority (MDBA) maintain a register of salinity credits and debits to keep account of actions that increase salinity in the river system, so they can be offset by actions, implemented elsewhere in the system, which decrease salinity. This accountability by Basin governments ensures on-going management of salinity in the basin to reduce adverse impacts on industries and the environment. 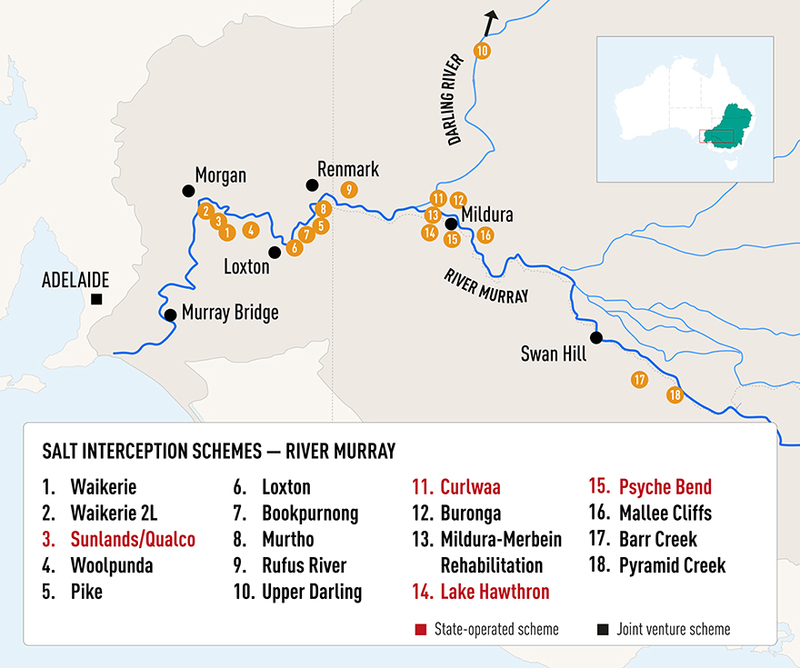 Under the River Murray joint venture program, we are also responsible for operation, maintenance and renewal of salt interception schemes that have been constructed over many decades. We coordinate the operation of salt interception schemes to achieve and maintain agreed salinity levels in the River Murray system. The Water quality and salinity management plan provides a framework for action to protect and enhance water quality and manage salinity in the Basin. The plan builds on existing water quality and salinity management agreements and arrangements and sets out objectives and targets to ensure the Basin’s water remains suitable for environmental, social, economic and cultural uses. This includes salinity targets for management of water flows at 5 reporting sites and water quality targets to inform development of measures as part of water resource plans for improving water quality. The 5 reporting sites include Murray Bridge, Morgan and Lock 6 in the River Murray, Burtundy in the Darling River downstream of Menindee Lakes and Milang in the Lower Lakes. achievement of the salt export objective. makes recommendations about accreditation of water quality management plans developed by the states as part of their water resource plans. Salinity remains a significant management challenge and poses ongoing environmental, social and economic risks in the Murray–Darling Basin. Salinity is forecast to continue to increase over time and requires careful ongoing management to prevent a return to the highly saline conditions of previous decades. The MDBA and Basin governments have a long and successful history of working together to manage salinity in the Basin with a new strategy now developed for the next 15 years. This strategy, the Basin Salinity Management 2030 (BSM2030), builds on the successes of the Basin Salinity Management Strategy 2001–2015 to deliver a strategic, cost-efficient and streamlined program of coordinated salinity management until 2030. This program will enable partner governments and their communities to manage salinity, during a period of transition, as Basin Plan water reforms take effect. Salt interception schemes will continue to be critical for protecting the river system from salinity. At a state level, existing salinity management arrangements remain in place and regional development can continue with confidence that salinity will be well managed. undertake a major review to ensure the strategy continues to guide effective management of salinity in the Basin.